School of the Ozarks sophomores perform Shakespeare’s “Comedy of Errors” for fellow students, faculty, and staff. POINT LOOKOUT, MO. — School of the Ozarks (S of O) sophomore class performed Shakespeare’s “Comedy of Errors” as the conclusion of an all-day workshop introducing students to William Shakespeare on Thursday, Jan. 10, 2019. Author, playwright, and master teacher Christy Sheffield led the second annual “Shakespeare Unseated” workshop. Sheffield taught high school English, speech, drama, and German throughout her 25 years in the classroom. 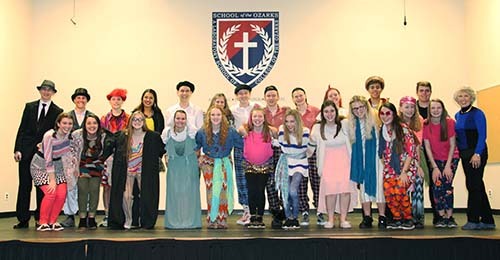 The sophomore class performed “Comedy of Errors” after just a few hours of rehearsal as part of the workshop for their school classmates, faculty, and staff in attendance. Amy Martin, S of O assistant professor of humanities, coordinated the all-day workshop and is the daughter of Sheffield. As a drama coach, Sheffield directed over 60 plays, many of which she wrote to suit the talents and interests of her students. Additionally, Sheffield is involved in an ongoing project to write children’s books which illustrate life principles. To date, her books include “Wondering” (courage), “Perseverance Pays Off” (perseverance), “Braving Difficulties” (courage), “Bill and Coo” (friendship), “Consider the Consequences” (common sense), “Use Your Patience” (patience), “Good Citizen Jack” (citizenship), “What Next?” (problem-solving), and “Lion Dog at Your Service” (service). Sheffield has been honored as a finalist for State Teacher of the Year, as an Oklahoma Foundation for Excellence Secondary Teacher of the Year, and as a Christa McAuliffe Fellow. She was among the very first National Board Certified Teachers in the nation. Additionally, Sheffield was chosen to attend a Fall Arts Institute on Shakespeare conducted by Peggy O’Brien, founder of the education division of the Folger Shakespeare Library in Washington, D.C.